Vegetables don't really require more care than ornamental plants, but they will be less forgiving of neglect. Your vegetable plants will be expending enormous energy blooming and producing fruit that never really gets to mature, as far as the plants are concerned. A plant sets fruit so that it can produce seed, but we tend to harvest vegetables before the seeds are fully formed. You can imagine how frustrating this is for the vegetable plants. Our job as gardeners is to make sure they have the necessary health and vigor to keep on producing. Neglect can also lead to lower yields and inferior vegetables because of more pest problems. Keeping your vegetable plants healthy and growing at a steady rate is the best insurance for a high yielding and delicious vegetable garden. Regular water is as important to growing vegetables as sunlight. Regular water means an inch or two per week - every week. More if it's extremely hot. Without regular water, vegetables will not fill out and some, like tomatoes, will crack open if suddenly plumped up with water after struggling without for awhile. You can't always rely on rain. If you have the means, a drip irrigation system is a definite plus for a vegetable garden. The new component systems are really quite easy to install and cost a lot less than most people think. And you'll save money on water, because it goes directly to the plant's roots. Less is lost to evaporation. If you don't want to opt for drip irrigation, try and site your vegetable garden near a water spigot. You'll be more likely to water if you don't have to drag the hose out. Vegetables don't like to compete with weeds for food and water. You'll have an advantage with a vegetable, since you'll be starting with an empty space each season. Be sure to remove any existing weeds before starting to plant and keep pathways and in between plants weed free by cultivating or hoeing and a good layer of mulch. Where Do Those Weeds Come From? Mulching - Why is Mulching so Important for Vegetable Plants? Mulching is one of the best things you can do for your plants. It suppresses weeds, cools plant roots and conserves water. Sometimes the plants themselves can serve as a living mulch, if they grow thickly enough. The preferred mulch for vegetable gardens is seed-free straw. It makes a nice cover, it's easy enough to push aside for planting and it can be turned into the soil at the end of the season. An extra plus is that spiders love to hide in straw and feast on garden pests. Vegetables are heavy feeders. Hopefully you have tested and enriched your vegetable garden soil, so a lot of supplemental feeding won't be necessary. 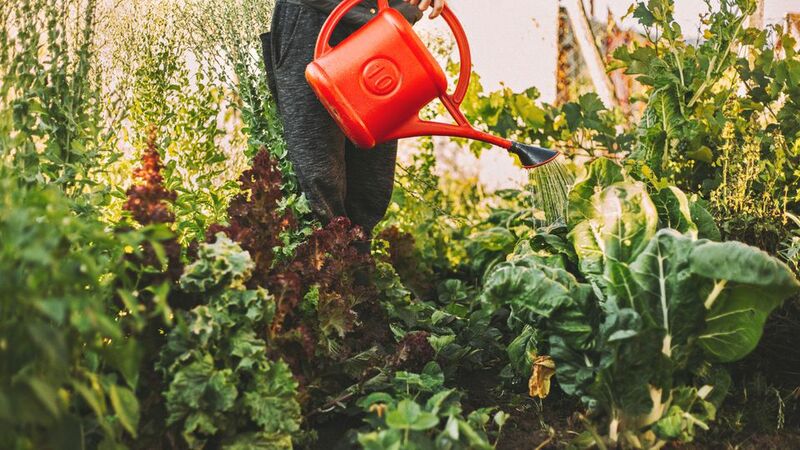 You should work some organic matter into the garden each year before planting and side dress with more organic matter once or twice during the growing season. Organic plant foods are slow releasing and will continue to feed your plants all season long. If you do opt for a water-soluble fertilizer, make sure the garden is well-watered before applying it. What is Good Garden Soil? How to Read a Fertilizer Bag. Staking PlantsTall and climbing vegetables will require some sort of staking or trellising. It's best to install the stakes at planting time. If you wait until the plant has grown before staking, you run the risk of injuring the plant roots. Pruning Tomato SuckersTomato suckers, or side shoots, are the growth that appears in the crotch between the stem and a branch. If left to grow, they will become another main stem with branches, flowers, fruit and more suckers of their own. Pruning tomato suckers is sometimes recommended because the resulting new stem is competing for nutrients with the original plant. You may be setting more fruits if you leave the suckers to grow, but the fruits will be smaller. Thinning SeedlingsIt is inevitable that when you start seeds, you wind up with too many seedlings. Removing the extra seedlings is called thinning. A lot of gardeners have a difficult time sacrificing seedlings, but leaving all the sprouted seedlings to grow too closely together will simply stunt the plants and reduce your overall yield. So be strong and thin your seedlings while they are small. Once the true leaves appear, you can remove seedlings so that the remaining plants are at the recommended spacing distances. If you can't remove the extras without disturbing the roots of the seedling that will remain, simply pinch the extra seedlings at the soil line. Keep the strongest, stockiest seedlings. Some seedlings are large enough to successfully transplant, but many will be sacrificed. Winter Cover with Green Manure Vegetable gardens that are left bare in the winter are susceptible to erosion and nutrient leeching. Since you've worked so hard to get great soil in your vegetable garden, it makes sense to try and keep it that way. One easy technique for protecting and enriching your soil in winter is to plant a corp of green manure in the fall and turning it into the soil in the spring. Green manures are basically cover crops that are grown to enrich the soil. They improve soil structure and provide food for the microbes, once they are tilled in and begin to decompose. Why aren't there Ground Covers for Vegetable Gardens? Wait, There Are.